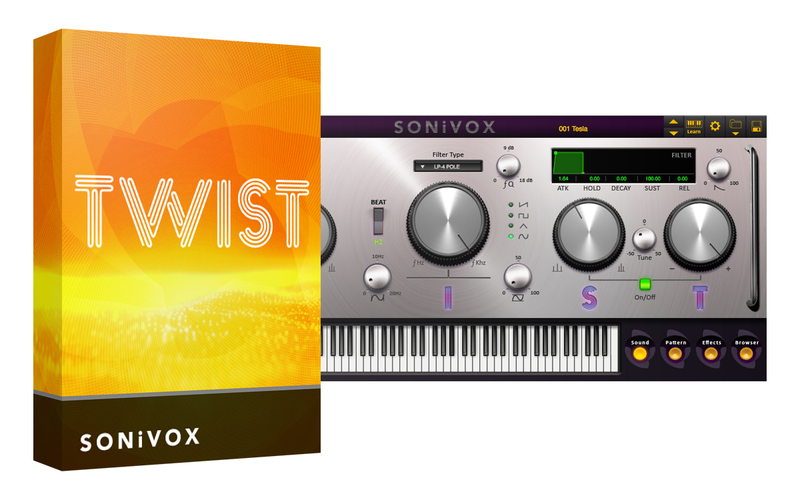 Wrap yourself around Twist 2—the Spectral Morphing Synthesis instrument from SONiVOX. Combining a dynamic interface, an advanced pattern generator, and onboard effects, Twist 2 is your toolkit for serious sound design using simple, time-saving controls. Two swirling sound layers provide unique harmonic controls, forming the foundation for every patch. Common elements include a monstrous multi-mode filter, independent Amp and Filter envelope generators, plus a remarkable LFO that can be sync’d to the current tempo. The onscreen interface is clean and uncluttered; the well-defined controls deliver incredible sound-sculpting abilities, while providing immediate audio results. In addition to the onscreen controls, Twist 2 features a brilliant MIDI Learn Mode. Simply adjusting a parameter and then touching an external MIDI control creates a link between the two. This intuitive MIDI mapping system allows Twist 2 to quickly integrate with your favorite MIDI hardware controller. In fact, Twist 2 can save and recall your MIDI Learn presets and use them with any patch, so you only need to create them once. The Twist 2 pattern generator begins as a familiar step-sequencer, and rapidly escalates into an unbelievable tool for sonic creation. In addition to pitch and velocity, the pattern generator provides additional tabs for adding precise measured-step control of crucial sound creation parameters. Portamento can be selected for each step, as can the filter frequency. LFO depth, rate, and sync can be defined per step. The harmonic width and content for each layer can also be specified. By automating even just one or two of these parameters, the pattern generator can infuse your sound with awe-inspiring depth and motion. Pattern presets can also be saved, recalled, and quickly modified on demand. Onboard pro-grade chorus and reverb effects breathe new life into your sounds. In addition, the stereo delay allows either the Left or Right channel—or both—to be synchronized to beat values of the current tempo, tying your sound, song, and effects together. And speaking of tempo, Twist 2 uses the SONiVOX Intelligent Rhythm Control (IRC) to keep your playing in the pocket. Combining the IRC Resolution and IRC Gate adjusts incoming MIDI note data so your playing is accurately in-time, in real-time. Twist 2 features an integrated patch browser that makes it easy to store, sort, and find exactly the sound you are looking for. Patch attributes such as Genre, Color, Character—and of course, Name—allow your sounds to be stored in a musically meaningful way, as opposed to just indexed as numbers. Any and all attributes can be removed or re-assigned as your sound collection grows. Best of all, Twist 2 comes with hundreds of professionally programmed sounds to get you started. Each one can be endlessly tweaked and modified to rapidly build your customized Twist 2 sound collection. So get started now!